Students worked individually and on teams to build projects, or “hacks,” which were judged on technical complexity, elegance, and creativity during an expo at the conclusion of the event. Contrary to popular belief, not all hacks require computer coding. “We call it an idea marathon,” explains Michael Bishoff ’16, computer science, a founder of HackUMBC. “It doesn’t have to be an app or a computer program.” In the past, participants have built tangible things like pop-up showers and coffee makers. Next year, HackUMBC would even like to incorporate a social good component, challenging students to come up with solutions to societal challenges. Wong’s dual major in social work and computer science has fueled her interest in finding real-world intersections between the fields, and she’s not alone. Many hackathons focus on how hacks can make the world a better place. As both Bishoff and Wong point out, these events can be great resume builders, but they’re even better when they create an opportunity to help the community. The event has drawn interest and sponsorship support from a variety of leading tech companies and government agencies. Dan Hood ’01, computer science, is the chief technology officer for one of those companies, ClearEdge IT Solutions, which provides provides software engineering and data solutions and services. Hood says that for ClearEdge, getting involved with UMBC and the hackathon makes sense — it gives their company a chance to see some of the brightest upcoming students, and they get to help those students by providing learning opportunities and exposure to the career options that await them. “I think it’s important to support the next generation of the workforce,” says Hood. The National Security Agency (NSA), a top employer for UMBC alumni, provided “technical talks, mentors, and recruitment opportunities” for students during the event, says Kathy Hutson, NSA’s associate director for human resources. 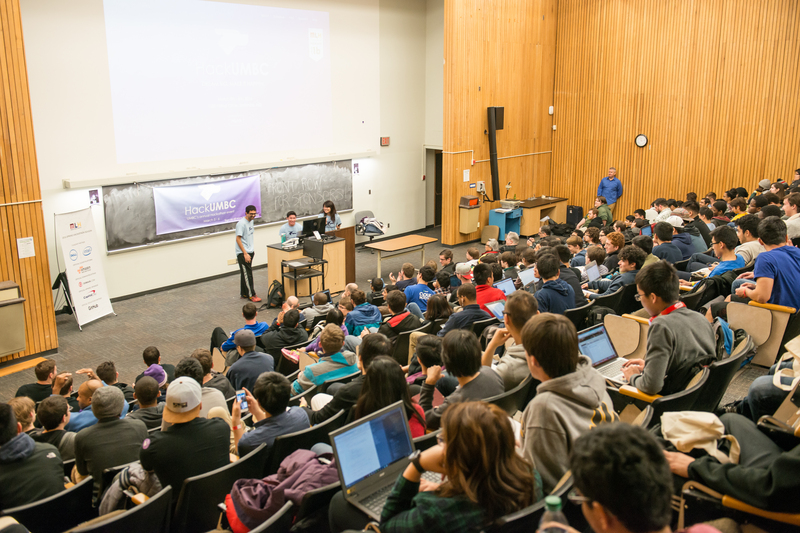 Tenable Network Security, a firm that provides comprehensive security technology solutions, supports the Hackathon because it values UMBC’s educational initiatives, its students, and its cyber-focused extracurricular activities. “The platform UMBC provided, which allowed companies to help students with hacking-related questions, was very useful in creating an innovative and collaborative atmosphere,” said Tenable Network Security’s spokesperson. That innovative atmosphere goes a long way to helping students gain the valuable real-world experience they’ll need to land a job. In fact, those extracurriculars can help students stand out amongst a crowd of applicants. Hood adds that the Hackathon gives students the chance to work in a team environment, navigate the stress of a time crunch, and be innovative. “To see [participants] go from nothing to concept to prototype in a day is pretty remarkable,” he says. HackUMBC was sponsored by Tenable Network Security, ClearEdge IT Solutions, the NSA, McCormick, TowerSEC, Northrop Grumman, PayPal, T. Rowe Price, VentureStorm, Namecheap, Soylent, Google, and Square.